Sundown is a fine album which weaves conventional folk and pop strands into a whole that is greater than the sum of its parts. 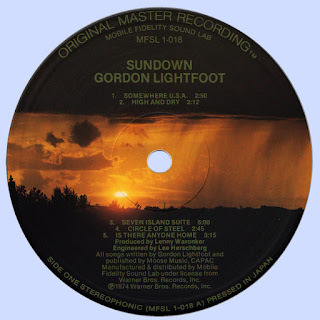 The polish of Lightfoot's singing has tended in the past to undermine the seriousness of his songs, inviting the listener to appreciate his records mainly as aural artifacts rather than explore their contents. But most of Sundown's 12 songs are so evocative that they prohibit such easy perusal. Lightfoot's singing is almost crooning—a style which under-states and redeems the rhetorical and sentimental conventions intrinsic to all formal songwriting. Producer Lenny Waronker has outdone himself helping Lightfoot achieve a balance between surface and substance, by providing a varied instrumental palette, richly acoustic and adorned by some excellent string charts from Nick DeCaro. 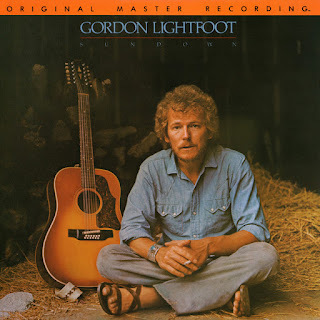 Lightfoot's reflections are those of a mature man, capable of strong romantic and political emotions, tempered by a suave sexuality and an elegiac mysticism. "Somewhere U.S.A." is a lovely evocation of romantic complications experienced during the daze of travel. "High And Dry" also celebrates travel and uses the image of a ship and its different skippers to affirm continuities. The six-minute "Seven Island Suite" is the album's most ambitious cut, and presents an elusive apocalyptic vision. More incisive are "Sundown," an ominous assertion of sexual jealousy, and "Circle Of Steel," a protest song about the antagonisms of welfare and poverty. The album's last and most powerful cut, "Too Late for Prayin'" is perhaps Lightfoot's finest creation. A modified hymn, somewhat reminiscent of Paul Simon's "American Tune," "Too Late" is both a prayer for our spiritual restoration and a lament for its absence. It is the work of a master craftsman whose endurance and prolificacy have yet to receive just recognition in the United States.